Natural cotton twill ribbon and coloured cotton twill ribbon from stock at midpac. 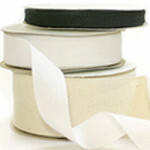 Our cotton twill ribbon is supplied on rolls 45 metres and is 19mm and 38mm widths. Printed cotton twill ribbon available direct from our Asian ribbon factory minimum 60 rolls printed 1 colour. Black Cotton Twill Ribbon Available in 19mm and 38mm widths 45 metres per roll ..
Brown Cotton Twill Ribbon Available only in 19mm width 45 metres per roll Nat..
Natural Cotton Twill Ribbon Available in 19mm and 38mm widths 45 metres pe..
White Cotton Twill Ribbon Available in 19mm and 38mm widths 45 metres per ..
Willow Green Cotton Twill Ribbon 19mm width 45 metres per roll Natural cotton..